In this piece we thought we’d use that idea as a different sort of angle on preparing for the upcoming World Cup. Naturally, most people will be watching to see the football and enjoy the general festivity that radiates from the tournament. But it just so happens that a lot of great world footballers have excellent hair and beards, such that any man who fancies himself a grooming enthusiast could learn a thing or two. This guide to the tournament can serve as a handy schedule for the different matches throughout (something that’s surprisingly hard to find in any kind of simple format on the internet). But we’ve gone through it and picked out four matches in particular to watch for grooming inspiration. France should be a treat to watch for anyone who’s on the lookout for good styling. This is among the best-groomed teams at the World Cup, perhaps rivaled only by Spain (and oddly enough, both are among the favorites to win it all). Midfielder Paul Pogba is famous for styling his hair in interesting ways, Karim Benzema has a consistently cared for beard, and Olivier Giroud might be the most meticulously well-kept man in the tournament field. Australia, meanwhile, is a team you have to glimpse at least once if you’re a beard enthusiast, because midfielder Mile Jedinak has become known as a “Beard to be Feared” for his exceptional thick, dark beard. In short, it’ll almost be difficult not to notice all the personal styling in this Group C fixture (which is on June 16th). Argentina doesn’t have quite as much going on as, say, France, but Lionel Messi - some people’s pick as the best player of all time - sometimes has an interesting look for us. He’s had long and short hair at different times, and sometimes goes with the beard and sometimes not. He’s not flashy about it, but he’s an interesting guy to keep track of. His skilled teammate Gonzalo Higuain has had a noteworthy beard at times also. Iceland, meanwhile, has worked to cultivate a sort of viking image, and it shows through in some of the players. Midfielder Aron Gunnarsson will likely be sporting a very impressive beard (perhaps second only to Jedinak in the World Cup), and star player Gylfi Sigurdsson tends to have a well-manicured bear and carefully styled hair as well. The real highlight though will be Birkir Bjarnason, another midfielder whose long hair just catches your eye as he moves on the field. Look through this list of the best beards at the 2014 World Cup, and you’ll see mentions of players at both Spain and Iran. Not all of these players are still active (Spain’s Xabi Alonso will not be at the 2018 World Cup), but the Iranians are. Iran’s Karim Ansarifard and Ashkan Dejegah have both sported very clean facial hair combinations over the years. Spain, meanwhile, is full of great beards this time around, even without Xabi Alonso. In fact, as mentioned, they’re probably the only team that can challenge France in the grooming category. Defenders Nacho, Sergio Ramos, and Jordi Alba and star midfielder Isco are among the names to watch for some excellent beards. Portugal’s Cristiano Ronaldo is usually clean-shaven, but can still stand out via his stylishly cut and often thoroughly slicked hair. Meanwhile, his teammates André Gomes and Ricardo Quaresma are likely to be sporting beards that would see them fit in nicely on the Spanish side. The real treat in watching Portugal and Morocco though will be the man stalking the sidelines for the Moroccans. 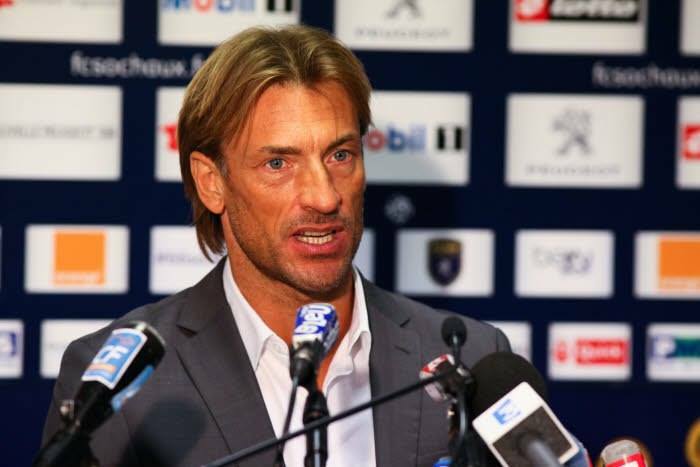 Head coach Hervé Renard has been said to look like Jaime Lannister, with long blonde hair, a stern look, and a traditionally too-tight and largely unbuttoned white shirt. He strikes quite the image, such that you might almost chuckle at him and want to look just like him at the same time.